Is Jive Software caught between a rock and a hard place? It’s happened time and time again: A startup comes out with a hot new “best of breed” software application and takes the market by storm. Then bigger established players develop or buy a competitive product and bundle it with their broader suite. It’s a pretty uncomfortable situation and one in which a range of companies find themselves in of late. One of them is Jive Software(s jive), which is known for its business-focused social networking and collaboration software. So it was probably no huge shock Jive’s stock price fell 12 percent August 1 after the company revised revenue and profit guidance downward on the second quarter earnings call. 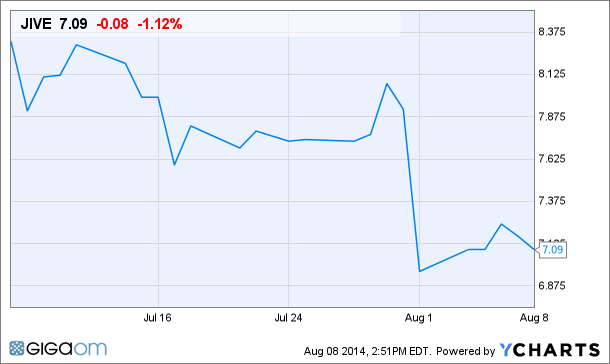 UBS downgraded the stock, same old same old, and shares fell to $6.96 per share from $7.92 the previous day. As this posts, Jive’s stock hovers around $7.11. Jive, which went public in early 2011, faces a couple challenges that doubtless contributed to those revisions. First, it’s tough to compete with free. And in July, Microsoft bundled Yammer, a Jive competitor, with more versions of its Office 365 application package. 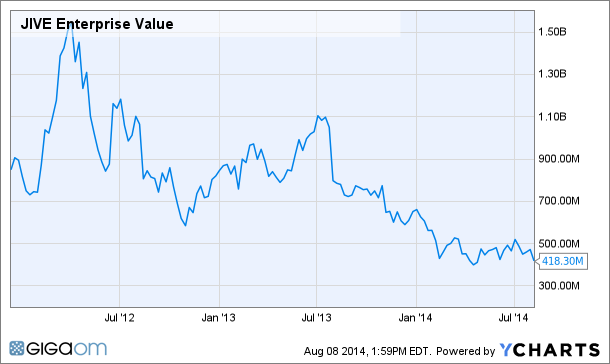 Salesforce.com(s crm) is pushing its own Chatter to its CRM customers. So just like that, Jive is up against the largest application software company and the leading SaaS provider in the world. Ouch. But that’s just one field of battle. On another front, it must contend with new mobile-first collaboration tools like Atlassian’s HipChat, Slack and Flowdock. “They will challenge Jive because they are a: lightweight b: cheap and c: intuitive,” said Gigaom Research analyst Stowe Boyd. Alan Lepofsky, VP and principal analyst with Constellation Research, said customer prospects fall into two camps. “The first is companies looking looking for something new and are trying to avoid their existing stacks,” he said via email. These customers typically evaluate startups like Jive or perhaps Tibco’s Tibbr and then choose whichever offers the best integration with their other tools and intranet. Chatter and Yammer are also available independently, so a Microsoft shop could theoretically use Chatter, for example. The second camp is companies that realize social is no longer stand-alone category and so go to their existing vendor — IBM(s ibm), Microsoft, SAP(s sap), Oracle(S orcle), Infor or Salesforce.com — to use that vendor’s product. Each of those aforementioned companies now field what he called very strong collaboration products. On its earnings call Jive also disclosed that John McCracken, SVP of worldwide sales will leave at year’s end. That news came five months after McCracken assumed the duties of James Larson, president of worldwide field operations, who left the company in March to become CEO of Birst. Churn atop the sales organization tends to make people nervous. But, Elisa Steele, Jive’s EVP of marketing and product, said Jive’s product integrates with both Microsoft and Salesforce.com products and that many shops prefer not to lock into one vendor for everything. And, as for McCracken, his is a planned exit and he’s working through a six-month transition of responsibilities to his successor company insider Chris Masino, she said. Still, it’s hard to argue that Jive isn’t under stress. It may even be on the market. In March, Re/code reported that Jive had hired Frank Quattrone’s Qatalyst Partners to explore its options. In May, its partnership with Cisco Systems sparked talk that Cisco would buy it. Later that month, Marketwatch reported that SAP had ended exploratory acquisition talks with Jive, seeing too much overlap in the companies’ product lines. Social Business is 25% product and 75% userstories, ideas, design. best practices, consulting and thought leadership. Any company can buy a small vendor and offer a social collaboration software along with the ERP or CRM but making a business ‘social’ needs a lot more. A holistic approach where all pieces have to integrate well to give a true social experience to the users. Products like Chatter; Connections and Successfactors etc definitely have an advantage since SFDC, IBM & SAP respectively are already incumbent in the customer accounts but I would still say success would depend much on how social business is made to work for an enterprise. For Jive, the opportunity is externally facing environments where collaboration between different entities loosens the product bound. In that area, they are competing with Lithium and Salesforce Communities. The internal market is not going to be as critical for future growth. Salesforce Communities is probably years away and philosophically burdened to catch up to Jive. Lithium does not seem to have the integration capabilities or vision yet that Jive has. Currently, Salesforce is the only threat to Jive. Microsoft is just stuffing Yammer in to Office 365 but the real industry usage undoubtedly has slowed down. Microsoft doesn’t have a strong ERP offering where they can integrate Yammer. Too bad Yammer hides behind Microsoft but it is probably facing the same slowdown that Jive is facing. Both Yammer and Jive need a ERP suite because it is difficult to sell standalone internal collab software. Rest of the vendors you mentioned are years behind Jive in building customer base and a collaboration platform (IP) for internal communities let alone external communities. In fact, Oracle, SAP are Jive External Communities customers because they don’t have one. Their internal community offering sales are almost negligible. IBM only has an on-premise solution which has remained stagnant. Netsuite, Workday don’t have any collaboration tools and they currently partner in this area. Salesforce is a monster in the cloud and if none of these companies (except workday due to partnership) react, then they will lose a major portion of the collaboration market and will be at a significant disadvantage when throwing the sales pitch. Also, a mature suite like Salesforce1 will require collaboration knitted in to every part of the entire suite (CRM, HR, Marketing, Finance etc). Salesforce is heading there with their platform and rest of them are still snoozing. Once Salesforce builds out a complete suite including financials (possibly buy financialforce.com etc), they will be unstoppable. This is why I think Jive will be bought out because it fills a major gap in these companies and help realize unexplored potential by building Jive building it in to their suite platform. Jive management understands the competition coming from internal collaboration which requires collaboration sold with a full suite to compete. This is why they were probably looking for a buyer. But Jive management knows not to bet on one horse. Jive has been focusing more on a growing market in external support/marketing communities. Jive along with Lithium are leading the way in a growing high potential market where Chatter communities is unable to compete due to the lack of dependence on ERP suite.